Make a well on the counter with the flour. Then add the eggs and salt. Slowly incorporate the eggs until the mixture forms a ball. Then bring together the dough together and knead for 5 to 10 minutes. Add additional flour as needed. Add the flour and salt and pulse. Beat the eggs separately and then slowly add in the eggs, one teaspoon at a time. Once the mixture just starts to look like couscous, stop and remove from food processor. Form into a ball and knead for 5 to 10 minutes on the counter top. Once the dough is fully kneaded, wrap in plastic wrap and let rest for about 30 minutes before rolling. 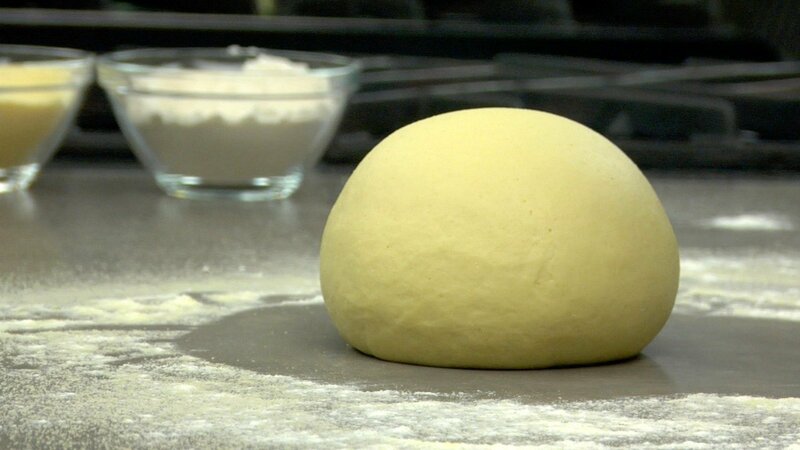 To roll the dough, flatten it slightly and roll through the widest setting about 10 times, folding the dough in half each time you pass it through. Sprinkle the rollers and dough lightly with flour if it happens to stick. Next, run the dough through the rollers just once on each setting without folding. Keep rolling the dough until you reach the second to last setting. How far you roll out the dough will also depend on the dish you are making, and your pasta machine. If you desire ultra-thin pasta, you may want to roll the dough right through to the last setting. 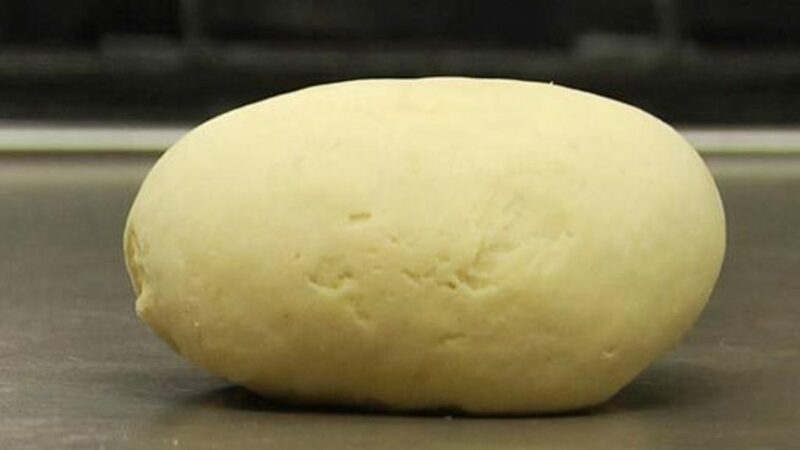 Once the dough has been rolled to the desired thickness, it must be covered immediately to prevent it from drying out. If desired, you can run the pasta through the cutters of the pasta machine to make various shapes, such as linguini or fettuccini. Fresh pasta is best if eaten the same day it is made. However it will keep for a day or two in the refrigerator. Once shaped, it can be frozen for up to one month. This makes approximately 3/4 lb of pasta, which will serve 2 to 3 people as a main or 3 to 4 as an appetizer. Adding water to pasta dough is often done to ensure it has enough moisture to bind when eggs are the main binding ingredient. Some like a combination of water and egg, even WINE and egg instead of water. A dough with some water will develop a bit more gluten and have a bit more texture than made without. I find it using the whole egg makes dough a bit wet!! Is it ok to use just yolk?? Egg yolks can be substituted for whole eggs when making pasta. It just makes the dough richer, due to the fat in the yolks (no fat in the whites). You just need to use enough yolks to bring the dough to the proper consistency. You might find it helpful to watch the lesson on Making Laminated Pasta. Hope this helps. Happy cooking! By hand requires a special thin and long rolling pin. Even then, the technique is not as simple as just rolling (would require a video, in fact). However, if you are patient, you can thin it out with a regular rolling pin, but would need to roll small amounts, about half a fistful of pasta at a time. Thats awesome I will research on that. Thanks a lot Tony. The after-note states the shaped dough can be frozen for up to a month. To cook, would it need to be thawed in the refrigerator or can it be placed into boiling water straight from the freezer? Hi Melissa. Good question. Cook from frozen. If you thaw, the pasta first, it will likely stick together. I have had some really exquisite hand made - ravioli at a number of restaurants. They always seem delicate and delicious. I recently tried to make ravioli using the basic pasta dough. I'm not sure what I did wrong but the results were very gummy. Maybe I did not roll the dough out thin enough? I used he second to last setting on my pasta maker. Or perhaps I used the wrong flour? I just used all purpose. There has to be something I'm missing. I use the same basic pasta dough, I also often use all-purpose flour. I also often roll the pasta out to the last setting (on mine that is a 9). I say try again...practice is what will make you good. If it seemed to thick, roll it thinner next time. Good luck! as I knead the dough, after a few minutes it looks like the dough is tearing? Should I stop at that point? Sounds like the dough is a bit dry. One way to remedy this is to wrap the dough with a damp warm cloth and rest for about 30 minutes. It should hydrate. At this point don't knead anymore, simply run through your pasta machine. The right pasta dough is tricky and requires a bit of experience. Your instinct to stop was correct. At the same time let the dough tell you what it needs: moisture or flour. And rest is always welcomed. Ever since I've started making fresh pasta, I haven't gone back to store bought pasta. I love it and in fact have given lots of pasta out to friends &amp; family (I tell them, "you've got to try it"). Just wondering, 1. If I give fresh pasta to friends, can it be stored in the fridge for a couple of days if it has enough flour on it? 2. When using fresh pasta for lasagna noodles, do I need to cook the noodles first, or can the fresh pasta sheets be layered in the lasagna and then cook the lasanga? Thanks so much! Fresh pasta won't store well for more than 3 days..will start to ferment. It can be frozen, but can also develop off flavors from the freezer and clump. Drying fresh pasta defeats the purpose of making it fresh...it does not produce cook to the same texture. It's okay to dry it, but I think not worth more than commercially dried pasta unless making it with special flours and/or flavors. Fresh pasta is one of those things you make when you want a special plate of pasta. I always cook my sheets when making lasagna. It results in a less gummy pasta and really, really makes a difference. Tony, that brings up the question--how long do you cook your pasta sheets? I did not precook my noodles when I made lasagna and it was fine. I'm assuming you boil them in salted water for just a few minutes? You are correct. Cook the noodles in boiling salted water until done. Depending on the thickness of the noodles the cooking time can vary - see step 7 of this recipe for an example. Cheers! What are your thoughts on semolina flour? You don't call for it, but isn't that the classic pasta flour? Does it need to be a certain grind? How does that affect the ratio of liquid? Is olive oil a good addition as part of the liquid? Semolina is the classic pasta flour for machine extruded pasta, not necessarily for hand-made pasta. Semolina is much harder and coarser than flour, so will produce a more textured pasta - good for cut pasta, not so good for sheet pasta to make cannelloni, ravioli, tortellini, etc. Adding olive oil makes the dough more brittle cutting into the gluten - again, good for cut pasta, not so good for sheet pasta which will crack more easily. I made this recipe the other night and the dough came out quite wet. I had to add quite a bit of flour to get to the right consistency. I used large eggs - but it's possible they were on the bigger side of large. Isn't the classic ratio for this recipe one cup of flour to one egg? Good to trust your instincts. You were correct to add flour to get the proper consistency. 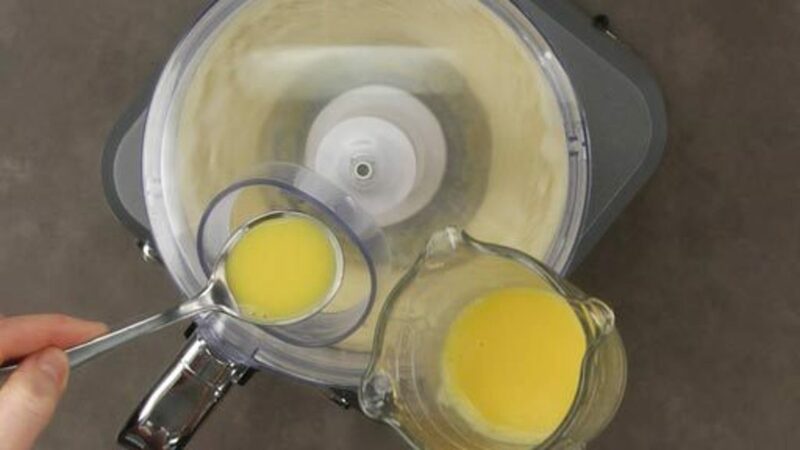 It doesn't matter how many eggs you use...you could use all yolks if you wanted for a richer dough. Also, everyone will measure flour differently...some pack it, some don't...some days it is humid, some days it is not (which will affect the amount of flour you will need). The point is to add just enough flour to obtain the proper consistency. Cheers! I think this may just be a case of practice. I suggest making it again and perhaps adding a bit less flour so the dough has a bit more moisture. If the dough sticks as you roll it out you can sprinkle the machine with a bit of flour to help prevent it from sticking. Good for you for following through and finishing the process. At least you had some tasty pasta after your hard work. Hope this helps. Cheers! I mean what do they do to make the pasta hard or dry like that? I can store it more than the fresh one. Good question, the difference between extruded and laminated pasta is quite significant. This is covered in the lesson in the Cooking School called Selecting Pasta" (in particular topic 3). Cheers! I have tried to make pasta by hand a few times with varying levels of success. Still I haven't got it right or easily enough to make me think it's worth the trouble. I'm sure it is and I know it takes practice, but here are my recurring problems. 1) When kneading the dough, it gets tough really quickly and starts to fold into layers. 2) When cutting the pasta in the pasta machine, the pasta starts to back up in the rollers. This has happened more than once and even after I made sure that there was no dry pasta bits left in the rollers. 3) The pasta that I have been able to cut lumps together when I store it in the fridge before cooking. I'm wondering how to trouble-shoot these - especially (3). Should I lay out the pasta a certain way or mix with cornmeal or something? Thanks for the help. 3) Yes, lots of cornmeal in-between sheets, to be brushed off before cooking. 2) Make sure to grab the pasta from under, pull and roll at the same time; dough may be a bit too wet, but based on 1) sounds like the dough is not coming out freely through the rollers and catching on to the flap underneath. 1) If folding into layers this means dough needs a bit more liquid. None of my students, who had similar pasta issues, would ever buy "fresh" pasta now. They had no choice but to practice and solve their issues. Pasta is not as simple as it looks, but once you get it, you got it for life. My husband loves pasta but is allergic to wheat. Would King Arthur's Gluten-Free Multipurpose Flour be a good substitute for the flour on its own or would I need to add something like xanthum gum as well. I have not worked with this type of flour before but pasta dough needs gluten or another product to give it elasticity. King Arthur's website for this flour indicates that xanthum gum is used in pizza dough, bread, etc., so you will have to experiment with adding some to make the pasta dough. Would be interested to hear how it works for you. Cheers! The recipe indicates that this amount will serve 2 to 4 (2 main servings or 4 small appetizer servings). You can double (even triple) the recipe but it just depends on how much you can handle kneading as the dough is quite dense. Depending on how much you want to make, you might want to do 2 large batches. Cheers! Hello: Today I tried making pasta in the food processor for the first time. However, I used the recipe I got at a fresh pasta cooking workshop - 1 cup AP flour, 1 cup semolina, 3 eggs, 1 TBSP olive oil, and a 1/4 TSP salt - and it was really hard to bring together to knead. I got to the couscous stage, and it felt nice when I pinched it between my fingers. But when I tried to clump it into a big ball and start to knead, it was tearing, folding over itself, and generally hard to hand. In general, I would say "more liquid," but it seemed to be plenty wet given the "food processor" criteria. Could it be that I used semolina? Something else? I'm a little frustrated because I wanted to put my brand new food processor to work, but alas . . . Some semolina is a lot coarser, which will not only require a touch more liquid, but also some resting time to give the large granules a chance to hydrate and soften - which explains why the dough is tearing. Wrap and rest the dough, then knead. Equal parts semolina to flour is not my recommendation, I'd use more flour. Also, 1 TBSP of olive in my experience is too much and can also lead to kneading and rolling difficulties. I have a very similar (possibly the same) question as Robert S: 3) The pasta that I have been able to cut lumps together when I store it in the fridge before cooking. Tony M said "3) Yes, lots of cornmeal in-between sheets, to be brushed off before cooking." My main issue is when I've actually cut the pasta into fettuccine or spaghetti or something. The first cut strands end up sticking together by the time I've finished cutting the last strands. Even if I only have 4 sheets to cut. They mostly come back apart if I agitate them in the boiling water, but not quite as nicely as I'd like. The lesson suggests tossing with a dusting of flour for the hand cut style. Would this also work for thinner, machine cut? Can I toss the floured pasta in the water? To prevent the strands from sticking together, whether hand-cut or machine cut, you can toss the strands with a bit of flour (as per the lesson). This is especially important if you are not cooking the pasta immediately. And yes, the floured pasta can just be added to the water (like we did with the freshly cut pappardelle noodles in the lesson). Also note, when cutting pasta be sure you do not stack it. Also, if you are storing the freshly-cut pasta in the refrigerator before you cook it, this will also add moisture to the pasta, which, in turn, can make it stickier. Cheers! I realize that times will vary with thickness. Do you check doneness just by tasting the noodles as they cook? Is the time shorter / longer than store bought noodles? Thanks. Tasting the pasta as it cooks is really the best way to test for doneness. As for store cooking at a different rate than homemade, the time all depends on which pasta etc. Also, remember that much of the store bought "fresh pasta" is really just extruded pasta. Cheers! I've tried making my own pasta twice. The first time I couldn't wait to use it so I made chicken and "dumplings". I made my pasta and cut 1"x2" strips to add to my chicken. The second time I made spaghetti with shrimp. I had a couple of issues with the pasta gumming up in the rollers. However, I began to dust the sheets with a little flour and that did the trick. I think I've had beginners luck. My family has loved the fresh pasta. What a difference! I want to add one more thing. Rouxbe...THANK YOU, THANK YOU, THANK YOU!!! Yes, if the pasta is sticking to the rollers, it could have just a little too much moisture. Dusting the sheets with flour is the solution. Nice work. Enjoy all of the yummy rewards from your cooking. Cheers! Hi Oscar - Yes, that is the hazard with oil in the dough. I've seen recipes that call for a very small amount of oil in the dough and I'm not sure if the flavor is actually different enough to warrant the hassle of not being able to roll through the pasta maker. Have you tried a pasta extruder with this style of dough? Cheers! I recently made a batch of gluten free lasagna sheets and froze them. i'm wondering if I need to cook them prior to making my lasagna or if I can make my sauce and stack frozen sheets in my lasagna with some extra liquid so the sheets cook in the oven? Similar to the dry lasagna sheet method. Ah yes, this has been a popular question in the past. You may want to check out this thread here. The short answer is "no, you don't have to cook them first, but the longer answer is that you might be happier with the end result, if you do boil them first. Hope that helps. Cheers! No worries Tom. In the end, the best way to truly know if something will work for you, is to try it out. You may find that you are perfectly happy with the end results of cooking the gluten-free pasta sheets from frozen – it sure would save a big extra step. Let us know how it turns out. And btw, good job on making your own gluten-free noodles. Buy "gluten-free" products these days sure can get expensive. I saw a bottle of water the other day that was labelled "gluten-free" — ah, when was water not gluten-free? :-) Cheers! .. after making fresh pasta, how do I store it in the fridge? In small nests, covered with a tea towel, or in tupperware containers? Would this work the same way with ravioli? At first, I tried making the dough in the food processor. It came out exactly like the videos from the machine. I believe the mistake I made with this dough was attempting to knead the dough on parchment paper taped to my counter (for easier cleanup). The parchment paper kept moving around and I wasn't able to knead it properly. Second, I only loosely covered it when setting it to rest and a tough skin formed on the dough after only 30 minutes. I tried to keep re-kneading the dough adding lots of water. I eventually gave up and rolled the dough anyway. It was way too dry and I wound up throwing it out. Last night I tried making it by hand. I did it slightly differently than the video. I took a large mixing bowl and added half the flour to form the well. Then I added the eggs in the middle. I mixed it and added a 1/4 cup of flour at a time until I got the correct consistency. I kneaded the dough initially in the bowl with my knuckles and then started on the counter. When kneading it, it still dried out a little, but somehow I was able to correct it. Before I let it rest, I put a thin layer of olive oil to prevent the tough skin I had previously. After 30 minutes the dough was very wet and I was worried it would stick. I wound up using a lot of flower on the rolling machine and an occasional dusting on the dough, but it came out perfect. I made some pasta noodles from this recipe today. The dough was a pleasure to work with. I rested mine for 30 minutes and rolled by hand. They did, however, come out chewy and not as thin as I wanted. I like my boxed pasta pretty well cooked and don't have much experience with fresh. I didn't cook these for long, 5 minutes or less I think. Should I have cooked them longer? I'm sure rolling thinner would've helped too. Good job Rachel. As for thinness and cooking times with fresh pasta — you are correct, if you wanted it to be thinner then yes, next time you will just want to roll it thinner. And for cooking times, you may want to refer to the lesson on "How to Cook Pasta" and also watch the lesson on "How to Make Fresh Laminated Pasta" these lessons will walk you through the process in much more detail then just a this text recipe. Hope that helps. Cheers! I didn't realize there was a video on cooking laminated pasta. Very helpful. Next time I will roll mine as thin as possible and test the cooking noodles. I think since mine were thicker, 5 minutes wasn't long enough.